The traveling exhibition, organized by the Newcomb Art Gallery in collaboration with the Smithsonian Instituteâ€™s Traveling Exhibition Service (SITES), also features jewelry, metalwork, needlework, linoleum prints and bookbinding. A lavish and scholarly catalog complements the ample wall texts and typically elegant presentation in the sixth-floor galleries. The Wolfsonian has contributed a fine audio guide, collateral programming and its own American Arts and Crafts-style artisan display tables. 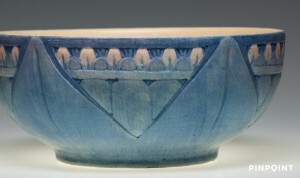 Women, Art, and Social Change is an exciting complement to The Wolfsonianâ€™s core collection, with the lifespan of Newcomb Pottery aligning closely with the collecting period of the museum,â€ stated curatorial and exhibitions assistant Whitney Richardson, who is organizing The Wolfsonianâ€™s presentation of the exhibition. 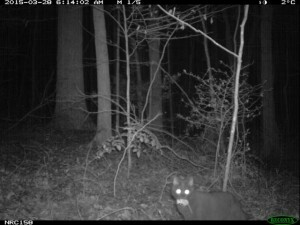 â€œDomestic cats are estimated to kill billions of birds and small mammals each year,â€ says lead author Roland Kays, a zoologist with NC Stateâ€™s College of Natural Resources and the N.C. Museum of Natural Sciences. â€œKnowing where they hunt helps assess the risk to wildlife.â€ The study is part of the eMammal project, which enables citizen scientists to collaborate with researchers at the Smithsonian Institution and NC State University to document animal activity. Co-author Robert Costello is with the Smithsonian National Museum of Natural History. Tavis Forrester, Megan C. Baker and William McShea are with the Smithsonian Conservation Biology Institute. The aim of Innoskate is â€œto change perceptions about skateboarding, to educate people about the science and the innovation behind the sport, and also, to really think about skateboarding as a way to bring life back into communities that are in need,â€ Halverson said. https://affiliations.si.edu/wp-content/uploads/2015/08/Allen-Ginsbergs-Family-Paterson-New-Jersey-May-3-1970-300x120.jpg 120 300 Elizabeth Bugbee https://affiliations.si.edu/wp-content/uploads/2019/03/si_Affiliations_rgb_single-line_color-280w-1.jpg Elizabeth Bugbee2015-08-26 16:50:302017-03-10 17:50:57Affiliates in the news! Affiliates end the summer with great news from the National Endowment for the Humanities and impressive accomplishments all around. Â Bravo! Description: Planning for the reinterpretation and expansion of a permanent exhibition, two traveling exhibitions, and a catalog that would examine the experience of Native American youth in boarding and tribal schools from the nineteenth century to the present. Description: A five-week institute for twenty college and university faculty on America’s maritime history. Description: Two one-week workshops for seventy-two school teachers on temperance and immigration in the Progressive Era. Project Title: From Immigrants to Citizens: Asian Pacific Americans in the Northwest Project Description: Two one-week workshops for seventy-two school teachers to explore the histories and cultures of Asian immigrants in the Pacific Northwest and their significance to the nation. Description: For preservation, collections and building management stakeholders to work collaboratively to achieve the best possible preservation environment, with the least possible energy consumption, that is both sustainable and appropriate to the particular collections that reside within the Centerâ€™s walls. Description: Two one-week workshops for seventy-two school teachers on theÂ textile industry in Lowell, Massachusetts, as a case study of early nineteenth-century industrialization. The National Society Daughters of the American Revolution (DAR) announced that the organization will be awarding a $7,120 grant to the Museum of AppalachiaÂ (Clinton, TN), to aid with the Peterâ€™s Homestead Roof Preservation and Restoration Project on an early 1800’s rare saddle bag style log house in Appalachian Pioneer Village. The Boeing Company and Mrs. June Boeing, wife of the late William E. Boeing, Jr., announced a philanthropic partnership, each contributing $15 million to significantly expand science, technology, engineering and math (STEM) education offered through The Museum of FlightÂ (Seattle, WA). These investments will launch the Boeing Academy for STEM Learning, a vigorous, new STEM-focused education initiative that aims to double the number of students served by the Museumâ€™s immersive programs over the next two years, particularly from communities underrepresented in STEM fields, and connect them to fulfilling, in-demand jobs. Ultimaker, one of the world’s leading manufacturers of 3D printers, based in the Netherlands, recently gifted nine new 3D printers valued at nearly $21,000, to the Maker Studio at Union Station Kansas City‘s Science Center, Science City (Kansas City, MO). The donation will allow better support of STEAM education during walk-up workshops and demos, school field trips, professional development programs for teachers, and special events. The South Dakota State Historical SocietyÂ (Pierre, SD) has received a $25,000 challenge grant from Pierre philanthropist Mansour Karim to fund an event for the Great Sioux Horse Effigy Return Celebration scheduled for October 10-12, 2015. Snug Harbor Cultural Center & Botanical GardenÂ (Staten Island, NY) is one of several Staten Island cultural organizations to receive a share of almost $1.8 million for various infrastructure projects by the city. Virgin America announced an education-themed partnership with the Frontiers of Flight MuseumÂ (Dallas, TX). As part of the partnership, the Burlingame, California-based airline will provide scholarships for students enrolled in the organizationâ€™s Flight School and other educational programs. Lynn Kelly, Chief Executive Officer and President of the Snug Harbor Cultural Center & Botanical GardenÂ (Staten Island, NY), has been appointed to the Board of Directors of the New York City Economic Development Corporation (NYCEDC). 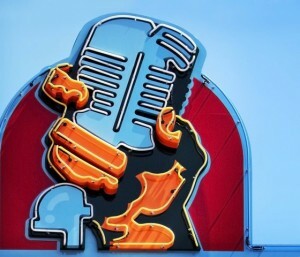 The American Jazz MuseumÂ (Kansas City, MO) announced the appointment of Ralph Reid as interim CEO. Reid retired this year from Sprint, where he was a Vice President and President of the Sprint Foundation. Back to school webcasts for everyone! The Smithsonian has archived webcasts available for use in all types of programming.Â Show a webcast and discuss local connections afterward, or partner with an expert to answer questions andÂ discuss with your audience.Â Webcasts can help organizations connect with schools or under-served audiences.Â Use a webcast to start the conversation and connect with your mission! Â Below is a listing of some of the webcast resources available at the Smithsonian. And did you know the Smithsonian compiles all of its resources for educators online? Check it out here! Finally, check out the Smithsonian VideosÂ YouTube channel for more ideas. Do you have online webcast resources you’d like to share? Let us know! https://affiliations.si.edu/wp-content/uploads/2019/03/si_Affiliations_rgb_single-line_color-280w-1.jpg 0 0 Laura Hansen https://affiliations.si.edu/wp-content/uploads/2019/03/si_Affiliations_rgb_single-line_color-280w-1.jpg Laura Hansen2015-08-26 12:57:522015-08-26 12:57:52Back to school webcasts for everyone! Summer is winding down but Affiliates are busy with great programs as fall begins. The Friends of the Polk Museum of Art will enjoy behind-the-scenes tours at the Smithsonian, visiting several museums and research centers in Washington, 9.9-9.12. The Smithsonian Jazz Masterworks Orchestra will give a concert at the Museum of Arts and Sciences in Daytona Beach, 9.26. Two Smithsonian scholars will speak as part of the Acadia Night Sky Festival organized in part by the Abbe Museum.Â Curator John Grant from the National Air and Space Museum will talk about his research on Mars, and Alasdair Davey, researcher and astronomer from the Smithsonian Astrophysical Observatory will present his latest solar research in Bar Harbor, 9.10-9.12. The Asian American Resource Center (part of the City of Austin Parks and Recreation Department) will open the I Want the Wide American Earth exhibition from SITES in Austin, 9.19. Over 95 Affiliates will participate in Smithsonian Museum Day Live! on 9.26. Is this exhibit on your event horizon? 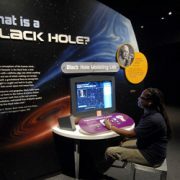 The exhibition Black Holes: Space Warps & Time Twists pulls visitors in to the modern search for real black holesâ€”the most mysterious and powerful objects in the universe. A view from the Black Holes exhibition. â€¢ Collect and weigh evidence for black holes. 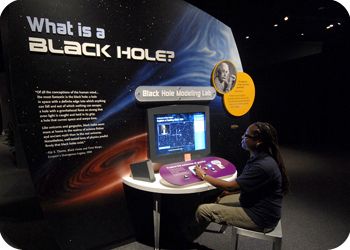 Evaluations of this NSF and NASA-sponsored exhibition document strong visitor engagement and significant gains in visitor interest and knowledge about black holes and how they are studied. Smithsonian Affiliates are eligible for a significant discount on the cost of renting this exhibition from ASTC this fall, plus free program materials and training for host-site educators from scientists and educators at Smithsonian Astrophysical Observatory. https://affiliations.si.edu/wp-content/uploads/2015/08/1679_What_is_a_Black_Hole_thm_round.jpg 250 350 Jennifer Brundage https://affiliations.si.edu/wp-content/uploads/2019/03/si_Affiliations_rgb_single-line_color-280w-1.jpg Jennifer Brundage2015-08-24 02:44:022017-03-10 17:50:55Is this exhibit on your event horizon? 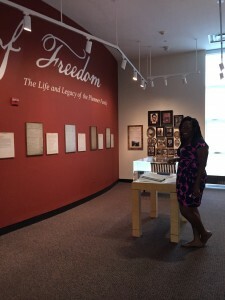 Special thanks to guest author Brittany Vernon, IMLS Apprentice at Ohio Affiliate, the National Underground Railroad Freedom Center, for this inspiring post. 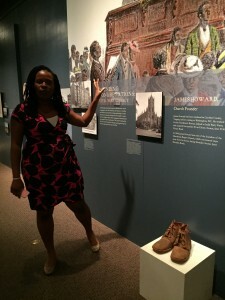 As an emerging museum professional, my current position as an IMLS Apprentice at the National Underground Railroad Freedom Center in Cincinnati, OH, is centered on learning as much as I can within the field while also gaining valuable work experience in my areas of interests. 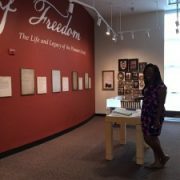 My passions are African American history and culture and public outreach to underrepresented people in museums, so the work that I do for the Freedom Center reflects that. As a co-leader of the museum’s Youth Docent Program, I get to reach out to local high school students, get them excited about what the Freedom Center offers through training seminars, and encourage them to volunteer as tour guides during their summer vacation. Yes, you read that right: teens + museum + volunteering + summer vacation – it seems impossible and certainly makes for a daunting task. It is also one of the most rewarding projects because of the personal growth and development each student experiences throughout the course of the program once they’re hooked. Now, when it came time to choose where I would spend my 3-week IMLS internship away from the Freedom Center, I wanted to choose a museum that was engaging in similar work. And for anyone with aspirations of working in the museum field, working in a Smithsonian museum in Washington D.C. represents the ultimate in education and museum leadership (besides being a total dream come true!). 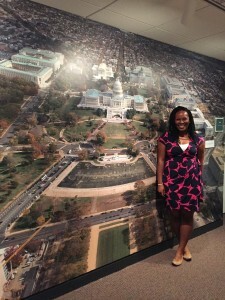 In picking a museum, I knew the Smithsonian Anacostia Community Museum [ACM] would be the perfect fit for me because of its focus on urban community issues and populations and its desire to engage teen audiences by starting a youth docent program. Brittany models the kinds of tours that teens might give of ACM’s How the Civil War Changed Washington exhibition. Using existing models including those at the Freedom Center and other Smithsonian Affiliate Museums, the ACM tasked me with creating a guide for a Youth Docent Program that they could implement in upcoming school years. After a week of research, tours and interviews with adult docents and Education staff at the ACM, I was ready to put together a plan. My proposed Youth Docent Program offers teens an opportunity to learn how to interpret museum content for the public and improve their own interpersonal skills and then earn community service hours by giving tours. Through monthly training sessions, teens learn about the content that the museum holds, and that it really is a place for them. Guest speakers and trips expose them to arts/culture-related career options. Finally, through research and writing assignments, teens feel empowered by the knowledge they now hold and are able to share with the public. The ACM is not alone in its struggle to get teens into its space. Museums across the nation have trouble attracting and retaining the interest of teenagers that for the most part would rather be on their phones than walking through a museum. But from my experiences, a youth docent program is the perfect first step in addressing the gap. When you hook teens with things they already enjoy like spending time with like-minded peers, social media, field trips, games and a guaranteed resume building opportunity, they are more willing to invest and learn a lot along the way. The end result is a group of teens that will advocate for your museum and encourage their family and friends to visit if not only to see the teens in action. Bringing fresh and youthful voices into museum settings that are sometimes thought of as static and rigid only adds to the wealth of knowledge that institutions like this hold, and shows that museums really can serve a purpose for people from all stages and walks of life, which I am all about. I encourage every museum to start some form of teen outreach if they haven’t already. Brittany passionately pursues African American history and culture, and issues of freedom and social justice in her museum career. Now that I am back at the Freedom Center, I look forward to continuing my work with the Youth Docent Program with a new group of students this year. I also know that the new Youth Docent Program at the Anacostia Community Museum will be successful in its efforts to connect more with teenagers in the Anacostia neighborhood. Hopefully in a few years, it can evolve to serve as a model for peer institutions that may have similar goals. Special thanks to IMLS, Smithsonian Affiliations, Smithsonian Anacostia Community Museum and the National Underground Railroad Freedom Center for giving me the opportunity to have this experience.